Muhammad Ali was one of the greatest heavyweight champions in the history of boxing. He was a boxing phenom, winning the 1960 Olympic gold medal and then storming through the heavyweight division as a pro and defeating champion Sonny Liston. His epic series of bouts with Joe Frazier and his upset of George Foreman added to his memorable story. Ali had an outsized personality and was one of the most recognized athletes of the 20th century. In the prime of his career, Ali trained hard before his championship fights. Run early in the morning. Muhammad Ali would get up at 5:30 a.m., don heavy construction boots and run six miles in under 40 minutes. Ali knew that his endurance was one of the keys to his success in the ring. If he did not get up and run early in the morning, he would lose much of the edge he had on his opponents. Shadow box when you get in the ring. Ali would shadow box for five three-minute rounds. When you are an experienced fighter, shadow boxing can be an excellent tool to help you sharpen your skills and work on your strategy. It is also an endurance-building drill. Take a 30-second break between rounds. Pound the heavy bag to develop punching power and balance in the ring. Hit the heavy bag for six three-minute rounds. Throughout his career, Ali did not have a reputation as a big puncher like Liston, Frazier and Foreman. But Ali stopped all three of those fighters and he was clearly a hard puncher. He used the heavy bag to develop his punch combinations. 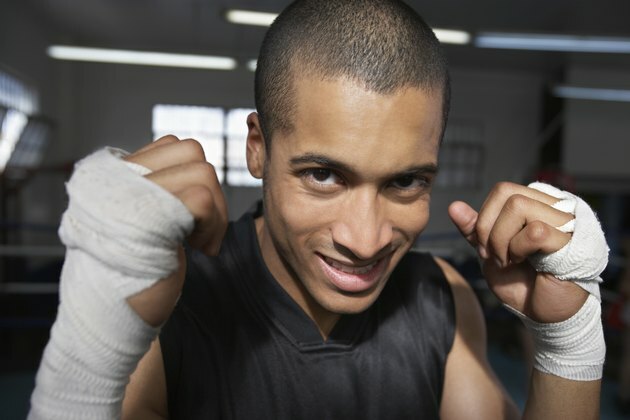 Spar with your sparring partners to sharpen your ring skills as you get closer to your fight. In his later years, Ali hated sparring and would clown around when he got in the ring. This aggravated trainer Angelo Dundee to no end. But as Ali was climbing the ladder in boxing, he would spar six to nine rounds three or four times per week. He worked on his ring movement, his hand speed, his left jab and his punching combinations. Hit the speed bag and jump rope to work on your quickness and hand-eye coordination. The biggest advantage Ali had in the ring was his speed and quickness. Boxing analysts rate Ali as one of the three best heavyweights in history, and he was clearly the fastest heavyweight fighter of all time. He would hit the speed bag -- also known as the speed ball -- for nine minutes. He would then jump rope for 20 minutes, always moving around as he worked on his quickness and balance.